As summer begins on Osprey Island, preparations at the Lodge -- the island’s one and only hotel — are underway for the busy season. On maintenance and housekeeping there’s Lance and Lorna Squire, Osprey locals and raging drinkers; and their irrepressible son Squee. There are college boys to wait tables and Irish girls to clean rooms. And a few unusual returnees, too: Suzy Chizek, single mom and daughter of the Lodge’s owners, who’s looking for a parentally funded vacation; and Roddy Jacobs, another former local, who has come back after a mysterious twenty-year absence. But when tragedy strikes, dark secrets explode, dividing the island community over the fate of a young boy suddenly more vulnerable to his violent father than ever. 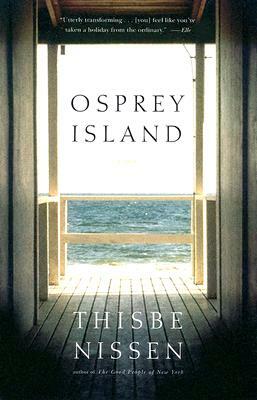 In the uniquely ephemeral atmosphere of a summer resort, Thisbe Nissen unfolds, with charecteristic warmth and charm, an ever-deepening story of lost loves and found romance, of loyalties and betrayals; and of lingering–sometimes fleeting–joy. Thisbe Nissen is a graduate of Oberlin College and the Iowa Writers’ Workshop, and she is a former James Michener Fellow. A native New Yorker, she now lives, writes, gardens, and collages in Iowa City, Iowa.